Announcing the iSchool, or Something | Daniel Katz, Ph.D.
← #FightForDyett: What Would YOU Sacrifice for a Fully Supported, Fully Public School? Apple CEO Steve Jobs was not known as a philanthropist during his lifetime, but his wife, Laurene Powell Jobs, had a significant track record in philanthropic endeavors by the time of his death in 2011. Educated with a Stanford MBA and with experience as a trader in Goldman Sachs, Ms. Powell Jobs has an extensive record in philanthropic activities since at least 1997, and education appears to be a specific interest. Beginning with a mentoring program for first time minority college attendees, she now sits on the boards of a number of familiar organizations such as Teach for America, New Schools Venture Fund, and Stand for Children. According to her “Inside Philanthropy” profile, Ms. Powell Jobs is interested in education reforms that are “results driven” which is education philanthropy speak for “raises test scores”. Hardly surprising, since her board memberships are groups that contribute to the deprofessionalization of teaching (TFA), raise capital for charter school ventures and advocate legislatures to allow charter school teacher training “academies” (New Schools Venture Fund), and which consistently attack teachers’ workplace protections and advocate for increasing the role of test scores in education and teacher evaluation (Stand For Children). 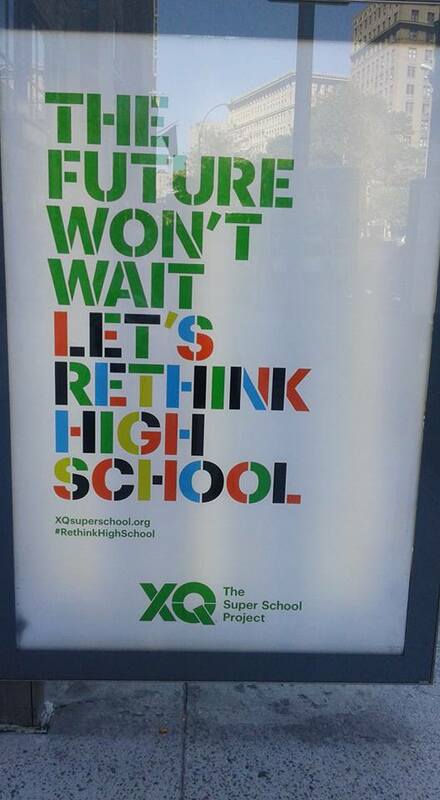 It should not, therefore, be a great surprise when The New York Times announced that she would donate $50 million towards a new education venture “to rethink high school.” The effort is called “XQ: The Super School Project” and Ms. Powell Jobs said in an interview, “The system was created for the work force we needed 100 years ago. Things are not working the way we want it to be working. We’ve seen a lot of incremental changes over the last several years, but we’re saying, ‘Start from scratch.’ ” This “from scratch” take on the American High School essentially looks like a grant program from the pot of $50 million that will eventually be distributed to 5 to 10 grantees sometime in the next year. The project website tells you precious little about the values of the project itself, which might be a good sign if they are serious about soliciting widely for actual, community based, ideas for school experimentation instead of just opening the doors for a bunch of ready made “disruptors” already at work tearing down public education. The composition of her core team as reported in The Times is not encouraging. There is a consultant named Keith Yamashita who has worked apparently mainly in technology and start ups. Russlynn H. Ali is the former undersecretary of education for civil rights under Secretary Arne Duncan and has been working with Ms. Powell Jobs’ Emerson Collective. More troubling is the presence of former senior adviser to New York City Schools Chancellor Joel Klein, Michelle Cahill. Education blogger, author, and Louisiana teacher Mercedes Schneider once dubbed Chancellor Klein as “The Man From Whom Nothing Good Comes,” and I’d daresay he earned the title. Certainly, the Klein Chancellor’s office unleashed a fair deal of havoc on Newark when Mark Zuckerberg’s 100 million dollar grant to remake the city’s schools was announced. Former Klein insider, Chris Cerf, created a consulting firm that hoovered up a fair amount of the available cash, and Cerf himself moved in 2010 to the New Jersey State Commissioner’s office, meaning he was now overseeing the district. Klein’s NYC department of education also provided Newark with Superintendent Cami Anderson, whose disastrous tenure is chronicled by retired Star Ledger journalist Bob Braun. Cerf and Anderson are most directly responsible for turning the Zuckerberg donation into the “One Newark” system, and Mark Webber helps fill in the holes in the most recent accounts of how that has turned out – especially in regards to Brick City’s charter sector. Short version: Joel Klein’s office provided a significant portion of the reform “talent” that spent lavishly on consultants and threw the city’s schools into an incompetently and callously managed mess that has benefited the biggest charter operators most of all. So let’s just say that the presence of another member of Joel Klein’s inner circle in a grant program to “rethink” schools requires serious skepticism. At least the amount of money being spent is only half of a Zuckerberg, and it will be spread around rather than dropped into a single school district with the intention of blowing the entire kit and caboodle up. However, I’d like the challenge two premises of the entire endeavor. The first premise is that we still have the high school we created “for the workforce 100 years ago.” In some respects this is actually true. The school model based upon a set of discrete subjects taught in Carnegie units with students moving from subject to subject during the day was an organizational choice of the early 20th century. Similarly, the comprehensive high school and extra curricular activities and sports with which we are familiar were choices incubated in the Progressive Era — none of these came down with Moses on Mt. Sinai. However, to suggest that the school structure you recognize as school is somehow rooted in place, unchanging and incapable of meeting more modern needs, is not supported by evidence. For example, that same school structure that Ms. Powell Jobs says was created for the workforce “100 years ago” has also graduated the workforces of the 1950s and 1960s as well as the workforces of the 1980s and 1990s – all economic periods vastly different than 1915. If one were to cite threats to the workforce in 2015, one would have to look at falling union membership, declines in wages for recent college graduates, a young work force burdened by mounting debt, corporate hoarding, unmet infrastructure needs, and taxation policies that have abetted income inequality before looking at how most ninth graders will study English for 50 minutes before moving on the their Algebra class. Schools contribute to the shaping of the workforce, but they do not create the economic demands for workers that necessitate that workforce on their own. And the reality is that the American economy has grown leaps and bounds with this same school system. In fact, from 1929 to 2015 “real” Gross Domestic Product in 2009 dollars (opens in Excel) grew from 1056.6 billion dollars to 16,324.3 billion dollars — all with that school system lamented as being designed for the workforce of 1915. Not bad. Similar progress and change can be seen in statistics relating to the educational attainment of women and to the number of children with disabilities being accommodated within public schools. And these statistics on increased participation, completion, and services provided do not account for changes in subject matter content over time as well. The fact is that there are many things about our high schools that have been significantly dynamic over the past 100 years. Integration: It matters, for both the majority and minority populations that are integrated, and we have historic evidence to demonstrate this. 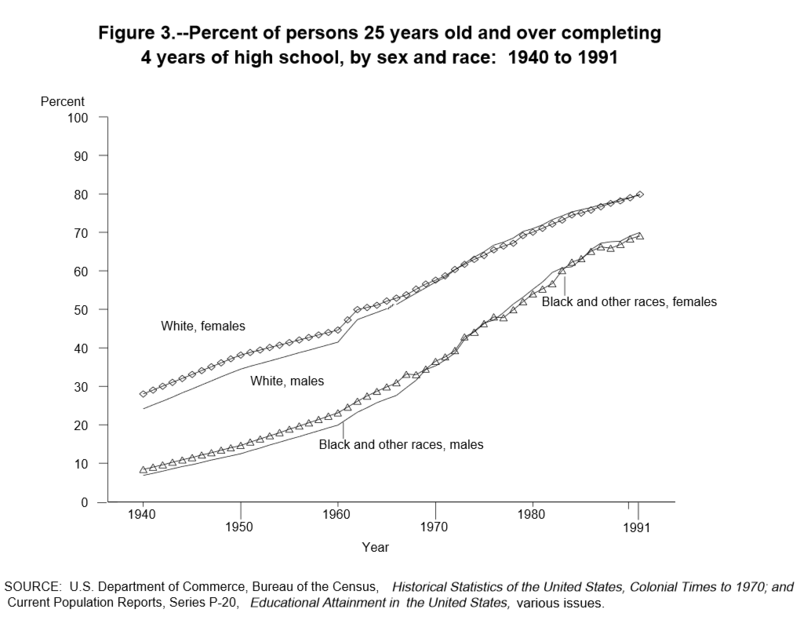 The decrease in achievement gaps between white and black students as measured by the National Assessment of Education Progress closed rapidly and for a sustained period of time in the 1970s and early1980s before the cumulative impacts of white flight and abandonment of fair housing and integration policies stalled progress. 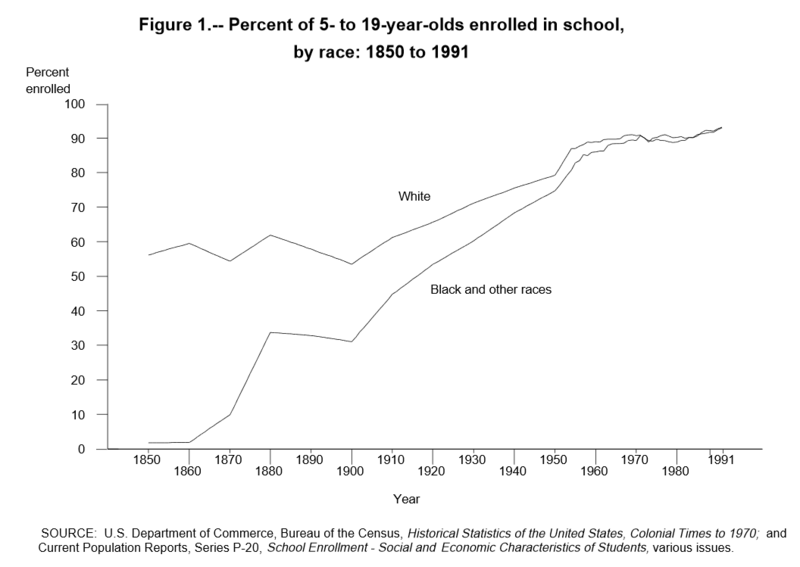 Since then, racial and economic segregation have increased vastly, to the great detriment of our students and their schools which saw an initial, large, burst of the gap closing after NCLB only to see it stall again. While the issue of the achievement gap is extremely multifaceted and overlaps with declines and rises in child poverty, integration of our communities and schools remains an important and currently unutilized tool in school improvement. Fair Funding: Advocates of current reforms like to scoff at school funding, but the reality is we maintain a perversely unfair and inadequate system of school finance that all but guarantees wealthy communities can fund the schools that they want while the rest of the system struggles to get sufficient state and federal aid to plug the holes in their budgets. Resources and policies the reduce inequality cost money, and the reluctance to fund those resources and policies is one of the greatest stumbling blocks to educational improvement. Class Size Reductions: Among the policies that can cost more money that politicians are reluctant to spend is class size reduction. It works. It works well. It works even better for poor and minority students. Increasing class sizes causes real and long term harm. Teacher Retention and Development: This will come as a surprise to the organizations on whose boards Ms. Powell Jobs sits, but experienced teachers are better than newcomers. The exuberance of youth is fantastic and necessary in the ongoing work of school, but it is best paired with experienced teachers who know what they are doing and who are willing to mentor their younger colleagues. If we want to improve schools, we should be looking at improving teacher retention, starting with a hard look at working conditions. Reverse High Stakes Testing’s Detrimental Impacts: We’ve increased the amount of testing. We’ve increased the stakes on testing. To the surprise of nobody who understands policy incentives that means we’ve increased the amount of time spent teaching to the test and to test preparation, to the detriment of a rich curriculum and especially to the detriment of students attending majority minority schools threatened with closures and other punitive measures due to test scores. The narrowing of the curriculum also has a detrimental impact on the very skills so-called education reformers claim our students need the most in the 21st century. If Ms. Powell-Jobs really wants to improve high school, she could do a lot worse than to imitate her late husband’s business practices and to try very hard to kill off something that Bill Gates has worked to promote: high stakes testing in teacher evaluation. $50 million is going to buy the XQ project a handful of high schools that may or may not be innovative and which may or may not be able to be scaled. Or it could begin the process of lobbying policy makers to endorse what we actually knows works in education. It would certainly be a lot better to see on the side of a bus kiosk. It appears a new word is demanded here. I think philatrophist might sum it up. I wish rich people would go back to building libraries and hospitals. Well, your iMpatient iZombies would find that so dull. More iFun to iToy with iSTEAMpunk variations on iVictorian iCademies. Beware of the malanthropists using false premises and false promises, and their hostile takeover of public education. With luck the $50M won’t go far. Fabulous and insightful….both characteristics clearly missing from any NYT of coverage of schooling. I enjoy some of their reporting but their love for “reform” drives me bonkers… thanks for the sanity!